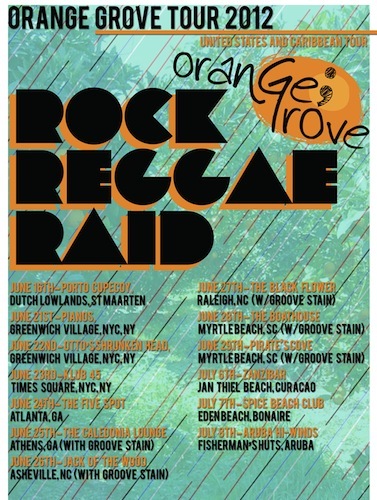 The reggae/rock band Orange Grove will be trekking its way for the first time across US soil out East for a handful of shows on the bands "Rock Reggae Raid Tour 2012". The band, which is primarily based in Europe have been making tons of noise overseas with a number of popular releases including 'Genuine Origins' and 'Fingerprint'. The band consists of 5 members who all have very much a story of their own. 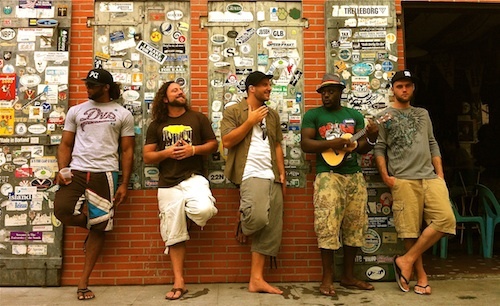 Lead singer Michael Maidwell was a memeber of the hip-hop formation The Hipnotix as well as Aruban reggae-rock group Honeypot before joining Orange Grove. Rhythm guitarist Jacob Streefkerk, born in the Netherlands, formed a popular Dutch rock band Intwine. Time Kesteloo, lead guitarist, is the youngest of the band and brings a metal mind from prior groups. Bass player Robert Pronk takes personal time out from his busy schedule to give private lessons out of his personal studio in the Hague. Lastly Robert Biesewig, drummer, also known as Bobby Stix plays for Dutch Idols winner Boris Titelaar. This is a band that prides themselves on their live performances, which have been known to last up to two hours from original tunes as well as the occasional covers sprinkled into their set. You will not hear the band promote violence in the lyrics because a positive message is their mission. If you have the opportunity to attend an Orange Grove performance I would suggest you bring your dancing shoes because the music that comes off their albums can only mean a live show will be one that is nonstop flavor from start to finish.